Western blot analysis of extracts from various cell lines using Livin (D61D1) XP® Rabbit mAb. 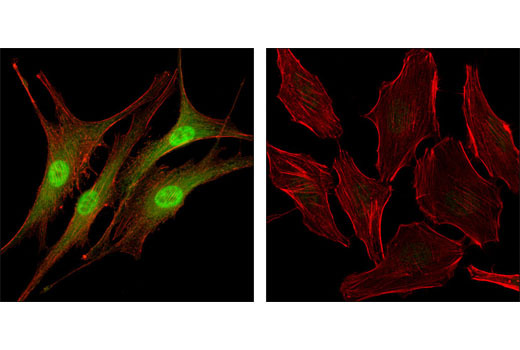 Confocal immunofluorescent analysis of SK-MEL-28 cells (left) and HeLa cells (right) using Livin (D61D1) XP® Rabbit mAb (green). Actin filaments were labeled with DY-554 phalloidin (red). 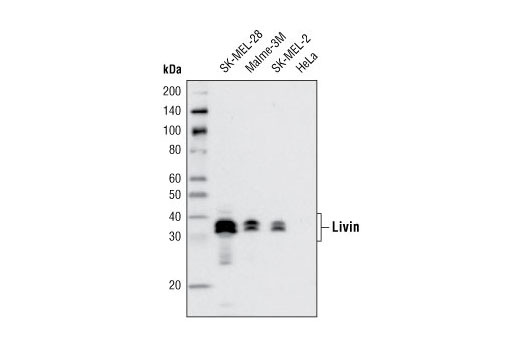 Livin (D61D1) XP® Rabbit mAb detects endogenous levels of total livin protein. Monoclonal antibody is produced by immunizing animals with a synthetic peptide corresponding to residues surrounding Ala195 of human livin protein. Livin (BIRC7/ML-IAP) is a potent anti-apoptotic IAP family member containing a single BIR domain and RING finger motif that is highly expressed in human melanomas and absent in normal tissues (5,7). It is localized in the nucleus and diffusely in the cytoplasm (5). The livin gene encodes two splicing variants, a 298 amino acid isoform (α) and a 280 amino acid form (β), with different biological activity to various apoptotic stimuli (8). In addition to directly inhibiting caspase activity, livin can promote the degradation of the pro-apoptotic protein Smac through the ubiquitin-proteasome pathway (9). Its preferential expression in tumor cells, along with several studies showing that downregulation of livin can promote apoptosis, has led to studies analyzing the use of livin in cancer therapy (10). Vucic, D. et al. (2000) Curr Biol 10, 1359-66. Ashhab, Y. et al. (2001) FEBS Lett 495, 56-60. Ma, L. et al. (2006) Cell Death Differ 13, 2079-88. Liu, B. et al. (2007) Cancer Lett 250, 168-76.